Your third molars are more commonly called "wisdom teeth." Usually appearing in the late teens or early twenties, wisdom teeth often lack the proper space in the jaw to erupt fully or even at all. This common condition is called impaction. When any tooth lacks the space to come through or simply develops in the wrong place of your jaw and becomes impacted, problems arise. Thus, it becomes necessary to extract them. Never fear. Wisdom tooth extraction is a relatively common procedure, performed on some five million patients every year. Your experienced Dublin dentists at Canal View Dental Surgery can take care of this procedure for you. Whether your Dublin dentist recommends wisdom tooth extraction as a means to prevent future problems or alleviate a condition you already have, the extraction of wisdom teeth can be an effective treatment to help your smile. As with all medical actions, we would be happy to discuss all aspects of the procedure, its benefits, risks, and alternatives in your individual case. When your Dublin dentist recommends wisdom tooth extraction it is in an effort to prevent dental problems in the future. If your jaw is too small for the new wisdom teeth then crowding will occur. Such crowding can lead to your wisdom teeth becoming impacted (that is, unable to emerge from the gums), potentially harming adjacent bone or teeth. Additionally, if your wisdom teeth come in at a crooked angle then they can damage teeth, harm the jaw, and cause bite problems. If a wisdom tooth doesn’t fully erupt then it has a greater chance of developing a bacterial infection as well. A cyst (a closed, fluid-filled sac) may also form around an unerupted wisdom tooth, which can turn into an infection and injure adjacent bone or nerve tissue. To potentially save your mouth from a myriad of dental problems like these, wisdom tooth extraction can be a simple solution easily completed by one of our trusted Dublin dentists. Wisdom tooth extraction is usually an in-office procedure. You would need to make an appointment with Canal View Dental Surgery at our Dublin, Ireland location. It's possible to have the treatment done with only a local anesthetic (numbing shot); this could keep you from experiencing any pain. However, if multiple teeth are being extracted at one time (as is often the case) a general anesthetic or conscious sedation may be administered. We will talk to you beforehand about the type of anesthesia that's best for you. Once you have been appropriately anesthetized, the gum tissue at the extraction site may need to be opened if the tooth is impacted. Your dentist will then gently remove the tooth. When the extraction is complete, you may need to have the extraction site sutured (stitched) to aid healing. After the procedure is over you will rest for a short time in our Dublin office before going home. Depending on what type of anesthesia you have, you may need another person to drive. 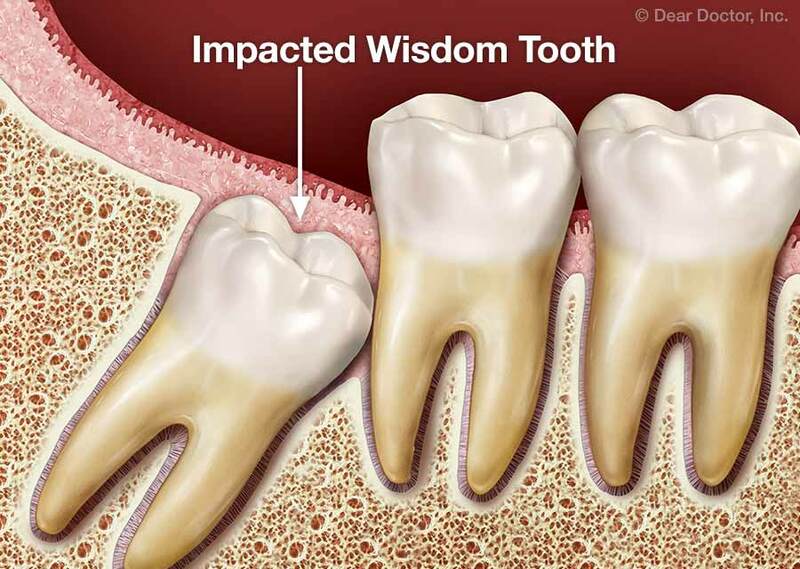 The recovery period after wisdom tooth extraction generally only lasts a few days. During this time you should rest to encourage healing and take pain medication as prescribed by your dentist. It's normal to experience some bleeding at the extraction site; this can be controlled by gently biting on gauze pads, changing them as needed, and resting with your head elevated on pillows rather than lying flat. You can also hold an ice pack on the outside of your cheek for a few minutes at a time (for example, five minutes on / five minutes off) as this may help reduce swelling the first day after the procedure. On day two, the warm moist heat of a washcloth placed on the outside of the cheek may make you more comfortable. Rinsing the mouth with warm salt water a few times a day can also help relieve discomfort. We recommend eating soft foods for the first few days after wisdom tooth extraction. On the same note, be careful when brushing your teeth or putting anything in your mouth until your healing is complete. As a whole, be sure to follow the post-operative instructions your dentist gives you; every wisdom tooth extraction is a little different and we customize our recommendations to make you as comfortable as possible. Make A Wisdom Tooth Extraction Appointment Today! Wisdom tooth extraction is a common procedure than many of us go through in order to prevent future dental problems and protect our smiles. If you’re at the age when your wisdom teeth are coming in, make an appointment with Dublin’s most trusted dentists at Canal View Dental Surgery. We would be happy to examine your teeth and recommend the best procedure for you!